Think of a rope. When it's tugged, knotted, coiled, or shaped to take a form (a question mark would be appropriate), the entire length is affected. Facility layout is similar: all parts make up one interconnected whole. Understanding the logical movement of people, materials and product traveling between the front door and the shipping dock is the primary challenge of developing an efficient plant layout. The ultimate goal is to optimize the workflow of people and product now and into the future. It's not a simple "bucket brigade"
If the production process was simply a matter of one person handing their work to the next person in line, like a bucket brigade, from the receptionist on down to the delivery driver, the task of designing an efficient layout would be child's play. As long as each one in the line was right next to their upstream and downstream partner, the production line could snake around any which way without any noticeable change in production output. The major operations of a manufacturing or distribution facility can be treated as if each were a single individual that simply hands its work “down the line”. But even with this simplest model we can easily see that there is nothing like a bucket brigade taking place inside most plants. Each department has multiple interactions with the others – the warehouse gets “handed” incoming shipments from the receiving department at the same time that it gets “handed” orders from the fulfillment department. It's doing half a dozen things at once for half a dozen different groups. Meanwhile, in the midst of all this, personnel are wandering away to find places to smoke, sit, eat or make a run to the toilet. Our metaphorical facility manager has a lot on his hands, and we haven't even mentioned how he has to juggle all the work-in-process, staging, and other material handling that is completely internal to the department. For any given department, there really are two layouts to be considered. The first is the layout of the overall plant and how and where the department fits into it. Let's call it “the grand scheme”. In developing “the grand scheme” we have to decide how much of the floor space each department gets. The second layout to be considered is the “internal plan” of the department. Here we need to think about equipment footprints and internal traffic and staging. You can see that the two layouts have to be related, more specifically, the internal layout of the department is constrained by the department's place in “the grand scheme”. This is the way that people who are not experienced typically approach a design problem. They usually have some specific idea that they've become fond of. It might be a certain arrangement of equipment, or maybe even just the particular location of, or view from, their office, but they'll grasp this nugget like one of those blind men who groped the elephant, and they'll try to develop their vision of the whole facility around it. It's like trying to draw a landscape by starting at one corner of the paper and sketching your way across the sheet to the other. By the time you get to the opposite corner the drawing has become distorted and badly composed. As anyone who has made a profession in design knows, each element of design influences, and is influenced by, many other elements. It's only when these elements have been selected, positioned, and configured in accord with some higher governing principle that they form a coordinated, efficient system or, in this case, an efficient and productive plant layout. In designer's language, the general principles that govern the overall design are called design programming or scope of work. This brings us to the 2nd most important principal of good layout: The choices that are available at any given point in a design are determined by the decisions that preceded it and constrains those parts of the design that remain to be developed. In other words, thou shall know thy design program and always keep it foremost in thy mind. This sounds like it should be obvious, yet this aspect of design work is overlooked. Often the emphasis and attention to detail is given to the main entry and front-end offices when designing a facility. And no doubt this attention conveys a strong message to both customers and employees. But often overlooked in the excitement to impress with new offices are the Shipping and Receiving department. True, this is the least glamorous area of a plant, but when you consider almost all your revenues exit there, the shipping doors just may be your most important openings in the entire building. Shipping requires the same attention to detail as any other department when it comes to size requirements, configuration, amenities and location (to facilitate its effectiveness and efficiency). It's a bit odd, but layout planning can start from the back end (shipping) and move to the front (main entry). This logic allows for the dog to wag the tail not the other way around. But even before considering plant layout, you must consider what impact the site will have on and to layout planning. Given this back to front planning logic, the site influences how and where you ship and receive product, which then leads where shipping and receiving should be located on the site. Think of a rope. When it's tugged, knotted, coiled, or shaped to take a form (a question mark would be appropriate), the entire length is affected. Layout is similar. Along its length (movement of people and product) all parts are impacted by any expansion, elimination of equipment, equipment installation, whatever. All parts make up one interconnected whole. Revisions like adding personnel, a department re-layout, or equipment installation impacts all areas in the plant sometimes in less than obvious ways. (for example re-routing of material handling aisle to accommodate installation of new equipment, reduction of work-in-process due to expansion). Just like assembling a puzzle, arranging the various pieces by shape and color, print out on 3 x 5 index cards the 8 areas of the plant (if starting from scratch) or a department's various internal areas if only expanding one department. Arrange the cards by preferred. Walk through the placement of index cards by discussing movement of people and product. Re-arrange placement of cards to suite your needs. If it doesn't work at this stage, do not proceed. Get it right at this stage or else your layout is going to flop. After all, your chances of placing the 8 cards in the right order is pretty good. The real challenge is making it work in an existing building you plan on renovating, or on a restrictive site, or at your present location. Do not work as a project team of one. Share your ideas and welcome new ideas. Encourage others to participate in the layout process, as painful as it might become. It's amazing how different people interpret the same problems found in the plant. You might interpret slow turn-around as an equipment related issue, which given your choice would be solved with the purchase of a new piece of equipment. The Production Supervisor, experiencing the same slow turn around issue, could interpret it as a manning (staffing) problem. What ever the case, inviting input by others will open doors which would not have been opened, and thereby addressing items which would have not seen the light of day. Logical planning will bring ideas and allow for constructive dialogue. As the air gets a little thinner each step you take to the summit of Everest, each phase of layout development gets a little harder. So, back to the cards. When you're feeling good about the overall adjacencies, the next critical step is to bring scale into the equation. Many a good man has thrown in the towel when scale enters the program. Let's just assume every department is a square with width & length equal. Cut out the shapes from some chipboard you have laying around the shop representing best guess square footage requirements. Scale brings a new challenge to putting the puzzle together. We can start by reassembling the scaled shapes in the same order as before. But it quickly becomes apparent keeping the previous adjacencies creates some interesting problems. For one thing, any sense of symmetry is gone (we all love symmetry), also some very interesting shapes appear. Remember, the objective is to put walls around material handling. Hang in there—Rome wasn't built or designed in a day. The key to resolving the scale and location challenge is to break away from the square department and stretch in either the x or y axis and by doing so allowing the flexibility to make the shapes fit together better. So a department figuring to be around 2300 sq. ft. (48 ft. x 48 ft.) can be shaped 31 ft. x 74 ft. Stretch and pull till your hearts content so the overall shape is more realistic and workable. Don't forget the employee services and production support areas. They may seem immaterial at this stage but when the time comes to locate these areas, it will disrupt the apple cart big time if they are not accounted for at the beginning. If you wait, you will end up compromising both the functionality of these spaces along with negatively impacting the areas around their forced placement. This is an important lesson. Playing catch up to warehouse layout design by adding areas or departments not originally figured into expansion plans is very dangerous. 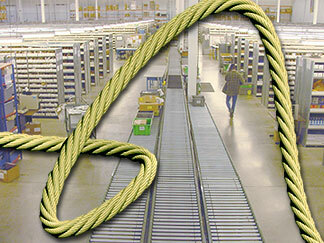 Not that plant layout can not be flexible to expansion or twists and turns impacting the industry, but when you consider the rope analogy, all parts make up one interconnected whole. When you are comfortable with the adjacencies and footprint (shapes) of the departments, ask yourself; (1) are there any areas which might become underutilized? (2) is expansion possible without adversely impacting any of the other departments or areas? Again, if the shoe doesn't fit, don't force it, go back and try again. The lesson here is that each step of the layout process can only be taken after you reach a level of real (not hoped for) confidence that it's right. And keep in mind this exercise is a lot less expensive than if changes take place during construction. "Just make it fit, I'm losing patience"
Now for the hard part. To see whether the department shapes will accommodate major equipment, while at the same time keeping in mind the roof will need to be held up by building columns—sometimes called “ I didn't know an 8 inch steel pipe could make my life miserable” columns. The sad reality is that equipment doesn't run with a steel column through it. When making the equipment “dolls” for this exercise, measure the entire operating area, including the overall dimension of the equipment and area around the equipment required for it's running (consoles, staging, work tables, etc.). We will have to make another assumption and that is the building columns will be in a grid measuring 30'x 40'. Actually we have some flexibility here. As long as the minimum distance is not less then 25 feet—to avoid a lot of columns—and maximum distance of 45 feet, so you don't begin to pay premiums on steel. Draw the column grid on translucent material so it can be placed over the layout to see where there might be interference. Place the equipment dolls in the appropriate departments, using good production flow judgment. This will take some time, be patient. When you figure this will be the seed that when germinated (built) will be your home for a very long time, the time you spend during this stage will be very worthwhile. Let's see what we have done. The final test will be to objectively determine whether the overall layout can accommodate inevitable expansion. The real test of any layout is whether it has an extended shelf life. If it can accommodate unforeseen new markets, growth of existing customers, installation of equipment never considered. Facilitating expansion is the yardstick to measure successful plant layout. Questions will come up during this initial layout process which you need to document. The idea is to make sure all outstanding items eventually get addressed. Remember unanswered questions will not just go away by themselves. They will eventually surface in the most inopportune time during the project. Start a project file where you can put all your questions and all other related project stuff together. Organization is critical. Successful projects depend on organization. Why is this necessary - or how come we can't just build something? Planning before you start construction is what will ultimately distinguish your plant from the others in the industry. It will give you the critical competitive advantage you are looking for due to its operating efficiencies. Following the elementary layout process described above will allow you to address many issues which eventually arise during either the construction phase or, worse yet, when you are up and running. Did we allow enough space for storage of office supplies; did we have that figured in? Does the receptionist area have a closet for customer coats; heck have we figured for closets at all? Are the employees going to have lockers? Did we allow for the space? The amount of hours spent on the project's front end, logically developing an efficient layout is directly proportionate to its success. More time, more chance for a successful layout. You must be committed to spending a lot of time during the initial planning phase before arriving at a layout that will work. Now for the good news, there are techniques and tools used by individuals in the business of layout and plant design that makes this process less painful, while at the same time giving you the ability to contribute to this most exciting process of creating something that will stand as a testament of all your hard work.